The Superman Homepage is pleased to join VCI Entertainment in announcing the DVD release of "Superman: The Ultimate Max Fleischer Cartoon Collection". The Superman Homepage worked closely with VCI Entertainment to ensure this collection of the 17 fabulous Superman cartoons from Fleischer Studios was the best and most thorough collection released to date. All 17 cartoons can be found on this special collectors DVD. Each episode has been digitally restored and is brimming with action and special effects. Each cartoon is beautifully drawn and colored, and brought to life with realistic movement. Click "read more" below to see further details and some screen grabs from the DVD. Fleischer Studios produced seventeen Superman cartoons and were shown to audiences between 1941 and 1943. It was typical for movie theatres to show at least one short cartoon before the feature film, which has since been replaced with straight advertising. This was the original venue for the Superman cartoons, though they have appeared on television since then. Superman's original medium was, of course, comic books, and his second venue was a radio program that began in 1940. Superman's first moving picture appearance, animated or live action, was in this series of cartoons. Their importance in making Superman publicly renown can not be understated. With only the comic books Superman would have been popular with children in America, but the radio and cartoon serials made the character so well known that he was soon recognized by all of North America, and then the entire world. Thanks in part to these cartoons his fame would snowball to create his lasting success and international stardom. The Superman cartoons have been fully restored to their original glory by VCI. The DVD also has some special features including a VCI exclusive recorded phone interview with the voice of Lois Lane herself... Joan Alexander. VCI, together with the Superman Homepage, has also put together a special bonus extra called BEHIND THE CAPE. The extra will take you thru each episode, giving you an episode synopsis, credits, and fun facts of each cartoon. Also included on this DVD are bios and a special insert booklet "The Super Guide to the Fleischer Superman Cartoons". VCI is one of the nation's oldest independent home video companies and has a library of over 3000 titles. Since VCI's first DVD release in 1999, its DVD library has grown to over 400 titles strong. The VCI library includes feature films, documentaries, short subjects, special interest and TV series. VCI's goal is to become a leading supplier of archival quality Hollywood Classics. Voice Cast: Bud Collyer, Joan Alexander - The 17 original animated Max Fleischer studios cartoons, based on the comic book character, Superman, released by Paramount Pictures were shown monthly at movie theaters from September 9th 1941 to July 30th 1943. Each cartoon is brimming with action and special effects, beautifully drawn and colored, braced with fabulous background paintings and brought to life with realistic movement. 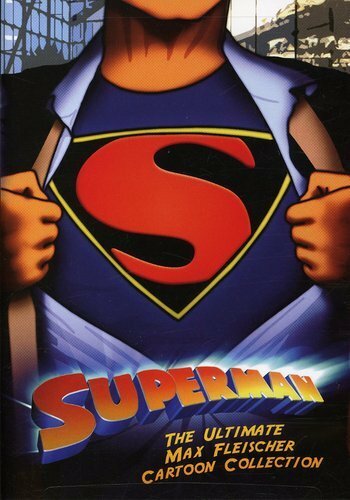 DVD Bonus & Features: Booklet - The Super Guide to the Fleischer Superman Cartoons, Behind the Cape: A Synopsis of each cartoon with fun facts, Bonus Cartoon - Snafuperman (a wartime parody of the Fleischer cartoons), Bios, Bonus Superman trailer for the Superman serials (1948) starring Kirk Alyn, Digitally Re-stored. Product Specs: DVD-9, Dolby Digital, NTSC/All Region, English Language.